There is something about love letters that is quite unexplainable. An old school charm attached to it and a personalized touch that is romantic and sweet in its way. So, this year why not write a love letter that they can remember for a long time? Get a blank set of canvasses from the stationery and paint them with a thick coat of white paint, possibly white latex. Now, make some pallet frames tracing them out to get a beautiful canvass to write on. Once done with the preparation, it is time to write the love letter. Ensure that you initially write down with a pencil as it will make it easier for you to rectify any mistakes as you go along. Next, use some watered-down acrylic paint along with some ink to paint down the penciled words. You need not to be an expert in writing letters. The trick here is to be imperfect. For this, you can try height variations and highlight some words or lines. Your partner is sure to go much over this sweet gesture of yours. Looking to get some personalized gifts for your loved one? Make sure to visit BlissLiving and grab exciting offers on your orders. You can never really have enough heart gifts on Valentine’s day. This time around, chuck the balloons and make a giant string heart for your partner. So what all will you need for this unique gift? A piece of wood, the bigger, the better, strings, a box of nails, some spray paint and a white paper. Start by spray painting the wood in the background color of your choice. Stick with dark colors here like dark grey which will make it easier for the string color to pop out. Once the paint has dried out, tape the wood with the white paper and then carve a heart shape onto it. Now, nail out the heart outline that you drew earlier spacing them out an inch apart. Remove the white paper once you have done the nails. This is where the fun part begins. Get the strings and tie a knot around the nails. Just keep stringing here as there is no hard and fast way of getting this done. Your only goal here is to carve a heart-shaped pattern with the strings. A simple yet easy to make a gift for your loved one. Who says you need just stationery items to make excellent Valentine’s Day décor? Nature is more than an open source for inspiration as well as handy materials. 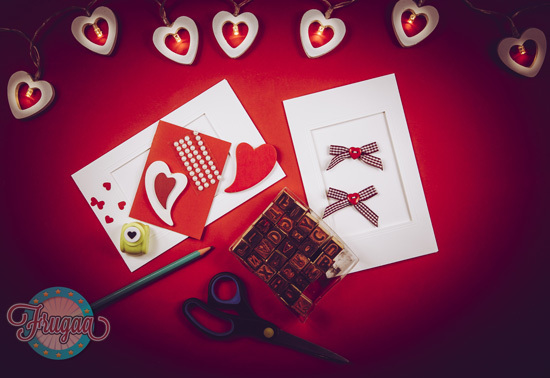 For creating this, you will need some scrapbook paper in different colors, baker’s twine in either red or pink, branches, white spray paint, and a white vase or pitcher. Gather some branches from your backyard. Ensure that they are all of the similar height. Once you are done collecting the branches, lay them out on a newspaper and spray them all white. Double coating helps in this case. Get some small clip-on birds and spread them out on the branches evenly. A sure way to fasten the hook in the twine is to knot them all with a little loop. Now, use a heart punch to carve out the hearts for your tree. String a piece of twine from the cut out hearts and scatter them across the branches. Finish the whole thing by putting them in a white vase or a pitcher. 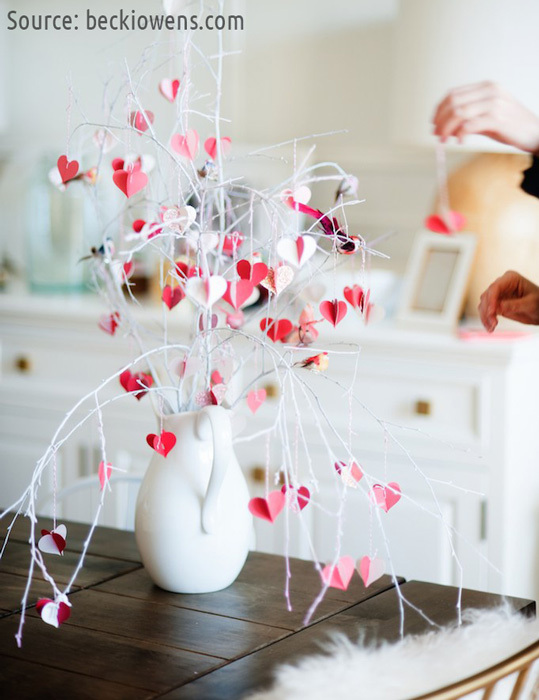 This heart tree will be loved by your partner and can even be used as home décor. There are many such exciting ideas online that teach you different and unique ways of making handcrafted decors. While there is still time for February 14, you can begin your preparation and search for raw materials from now itself. 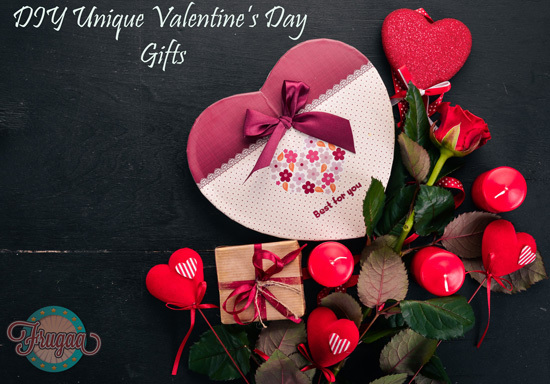 Speak the language of your heart with these beautiful gifts this year for your partner.